Did your most recent Marketing Plan deliver on what it promised? Did it yield the desired results? Chances are you’ll have to confess it simply didn’t. You are not alone. Just 34% of B2C marketers say strategy guides efforts very closely. And just 27% of marketers have a well-documented content strategy. Today’s environments are too dynamic to plan far ahead. The world is simply changing too fast. Yearly marketing plans are outdated within a couple of weeks. Ideally, you want to be able to adjust activities by the hour. You want to be certain your team is always working on the strategy and doesn’t get sidetracked by ad hoc, superfluous tasks. Now, you could say if people aren’t going to stick to the strategy, why write it down in the first place? If you don’t write down your marketing plan, you allow one disappointment to breed the next. From there it will go downhill fast. There is a way to stop struggling with your Marketing Plan. What you are looking for is a written plan that marketers actually stick to. You want a plan where in company goals are translated into actionable tasks. And on top of that, you want to be able to proof how everything you do contributes to company success. Am I right, or am I right? Sounds utopian? Not to our clients. Don’t take our word for it: take our clients’. They developed a workshop wherein marketers can craft their marketing strategy. At the end of their day, clients feel so confident about their strategy that they don’t even shy away from presenting it to their CEO. And there’s a reason for that. For many marketers who created their marketing plan in 1 day, it is the first time they’ve been able to show how their specific targets contribute to company goals. After the one-day workshop everybody knows how their activities fit into the bigger picture, inside and outside the marketing team. They can now actually quantify what marketing is doing and can justify pursuing one goal over another. On top, they save a considerable amount of resources because they now know they can scratch 30% of their tasks without lowering productivity. And every CEO likes that! When you take just the right approach, you can give the CEO what he wishes for. When he can be assured project ROI is good, he’ll gladly assign generous budgets to marketing projects. And that, of course, is what CMOs dream of. Here’s the secret recipe for getting results with the one-day workshop. We’ll tell you exactly what we did at every hour of the day. If you read the hour-by-hour diary as a template, you can repeat our success yourself. Is your department struggling to formulate and stick to the marketing plan? You know what to do: follow this workshop template. Bring focus and start saving. Download the PDF here, or read it below. Exercise: Write down all your activities on separate post-it notes. Tip: Collect tasks and vaguely described aspirations from presentations and spreadsheets you have lying around. Take into account all campaigns, all collateral… all everything! Result: A complete overview on all marketing activities. Example results: A client found 134 separate activities in total. Exercise: Take your activities to write down your marketing goals. Tip: Use the Definition of Success. 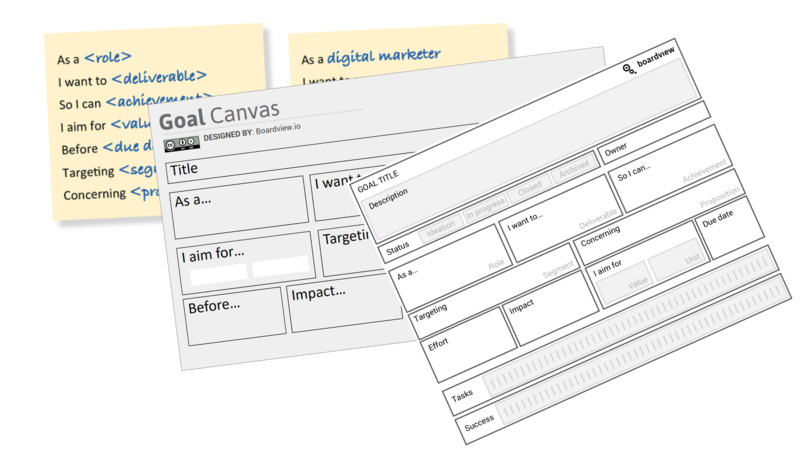 Download our Goal Canvas and distribute them around the group. The canvases encourage you to think about what goals you are trying to achieve by looking at the tasks you’ve noted down earlier. No need to fill out the entire Definition of Success just yet. But at least specify ‘I want to…’ and ‘I aim for…’. 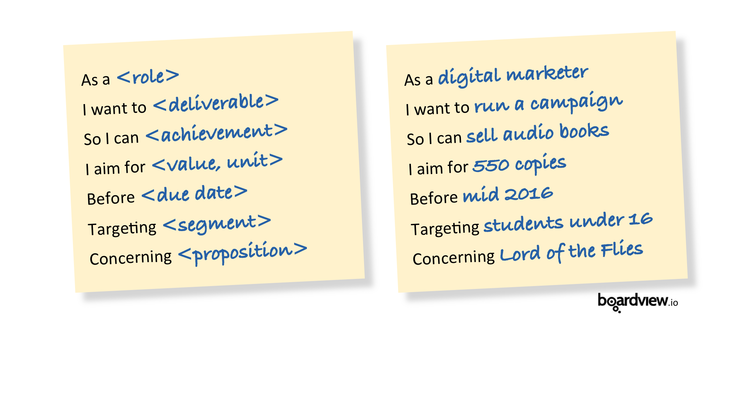 Then try to specify ‘So I can…’ to distill your (provisional) marketing goals. 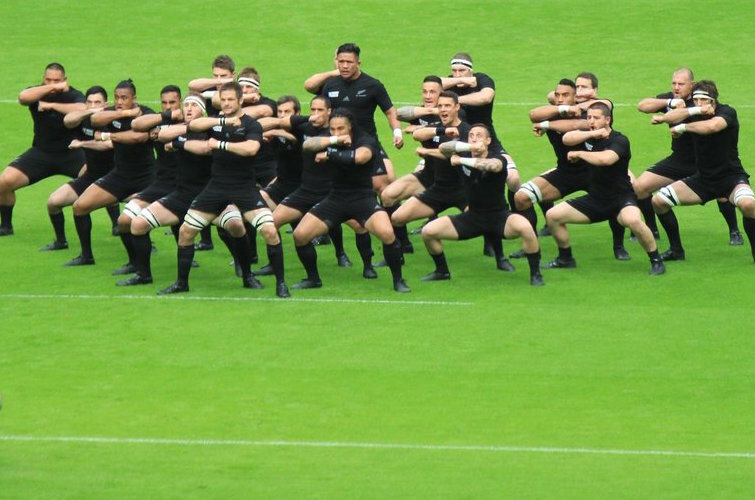 Pass around the canvases to give everyone involved a chance to improve the goals. It will spark interesting conversations and knowledge sharing! Result: A complete overview on all marketing goals that are made SMART. Example results: A client formulated 81 goals in total. Exercise: Map the goals you just formulated. Tip: Categorize the goals according to a funnel structure. Draw a funnel on a flip over or whiteboard and stick your goals to the funnel category you think they fit best. Result: A tree of goals that add up to the main goal of your marketing plan. Don't worry if can't allocate a portion of the goals. Example results: A client came up with 4 categories: Awareness, Grow, Keep, Internal. For more funnel structures, see Level 2 of the funnel in this blog. Reward yourself with a break! Coffee? Anyone? Exercise: Remove all goals and activities that do not align with the strategy. Tip: To know if goals align with strategy, ask yourself if they drive revenue, either directly or indirectly. If the goal does not drive revenue, get rid of it! If the activity does not drive a goal (indirectly), get rid of it! Result: Your lean & mean strategy on Post-it notes! No more noise and confusion. Example results: A client found that 60% of goals drove revenue (indirectly). 10% was parked. 30% was out! Exercise: Check if you have the resources to execute the strategy. Tip: Put the goals that survived the cut into the Boardview.io app. You can now assign goal Impact and the goal Effort required more specifically. You’ll discover where your blood, sweat and tears will have the most effect on achieving company goals. Result: All strategic goals (for the next quarter) have an effort estimation. Compare your available resources with the required resources. Example results: A client found they needed some additional budget to meet the company goal. Exercise: Dress rehears your strategy presentation and then show the CEO exactly how this year’s marketing initiatives contribute to the bottom line. Look for that subtle smile as he discovers that you do indeed know what you’re talking about. Then watch as he pulls out his wallet to assign a generous budget to your marketing goals. What are you waiting for? Schedule your One Day Marketing Plan Workshop today!